Is there a lack of availability of OsF (old-style figure) faces available these days? 99% done on a book layout job, entirely in Janson Text from Linotype, but now must find and purchase the italic OsF, which, surprisingly, Linotype no longer seems to offer. Has OsF fallen so out of favour that it's rarely offered any longer, and why? 3 rather dubious and crap-looking sites appear to offer it, but look totally unsecure. Why isn't this font available from somewhere reputable? Janson Text LT Pro 56 Italic has Oldstyle Figures. They're just no longer packaged as a separate font. Janson Text LT Std 56 Italic (i.e. not Pro) from 2002 has osf, too. 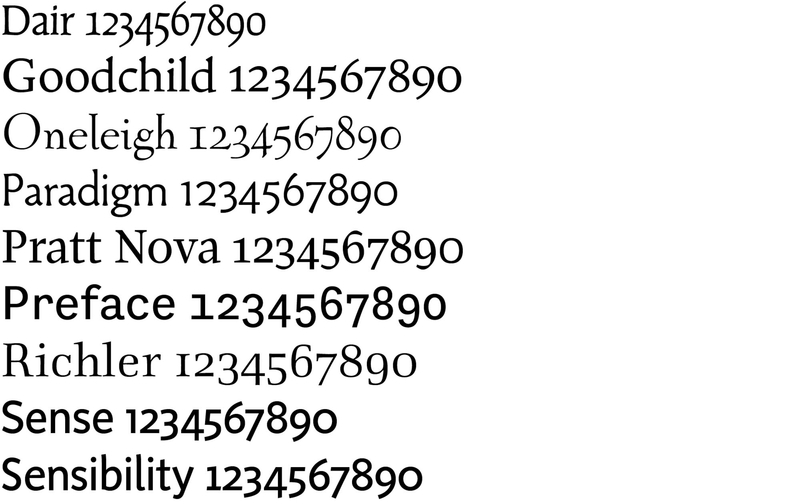 You can activate them via OpenType features. TypeNetwork doesn’t carry Janson Text, but they just published a guide to working with various figure styles. At the end of the article, under support, you’ll find illustrated info how to access the different figure styles in various applications. Type.co.uk is the site of Fontworks and that is/was just like Signumart a well known font company. I guess they still use the old Linotype database, so that is why you see the OsF version. Is there a lack of availability of OsF (old-style figure) faces available these days?